The first half of Bautista’s season – 12 games with the Braves – suggested nothing of a throwback performance in the future. Yet in the first 12 games into his Mets career, according to TAv, we’re witnessing a number in-between his 2010 and 2011 MVP-contending campaigns. Will we see those gaudy numbers throughout his tenure in Queens? It’s doubtful that this pace will be kept up, but, in examining these competing halves of the season, we’ll explore which alterations are sustainable (i.e., did he just need his own spring training?) and which…well, his BABIP in the first 12 Mets games was .429. In 2015, then-Astros assistant general manager David Stearns spoke about the reliability of spring training for making personnel decisions, telling Baseball Prospectus, “We would love to make every decision based on 1,000 plate appearances in major league competition, or 400 innings in major league competition. We rarely have the ability to do that.” In the case of Jose Bautista, we do have this amount of data to analyze – nearly 7,000 plate appearances, in fact. 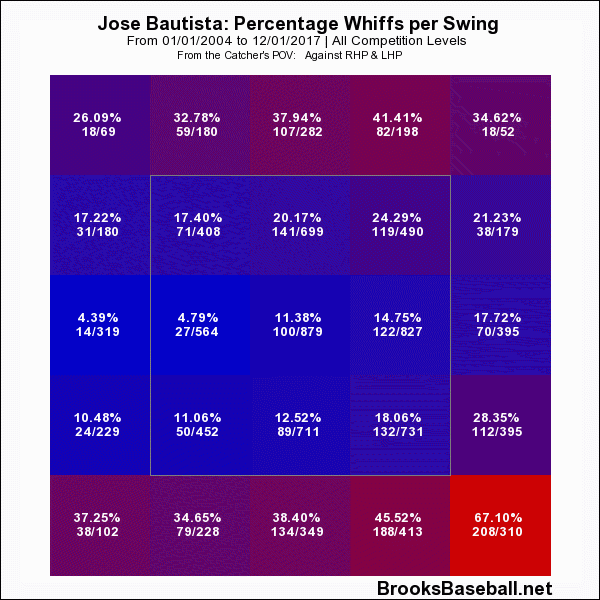 From his debut in 2004 to the end of the 2017 season, Bautista’s whiffs/swing chart looks like a pleasant gradient: light-ish blue in the middle moving in both directions towards a few shades of reddish purple. In numerical terms, his zone contact rate from 2008-2017 never dropped below 81.92%, and for out-of-the-zone contact, he moved between an okay 50.25% and an impressive 70.77%. From the pre-2018 data, it looks like he possessed a patience that could only accompany the confidence of contact being more of a given than not. This season, however, he began to exhibit an uncharacteristic tendency to swing more frequently and obtain less contact. Examining each variation of the count between the two teams, a renewed discipline appears since he’s worn a Mets uniform. The player who has three seasons of more walks than strikeouts is near that mark again in Queens, due in part to approaching two specific pitch counts far differently than he did in Atlanta. 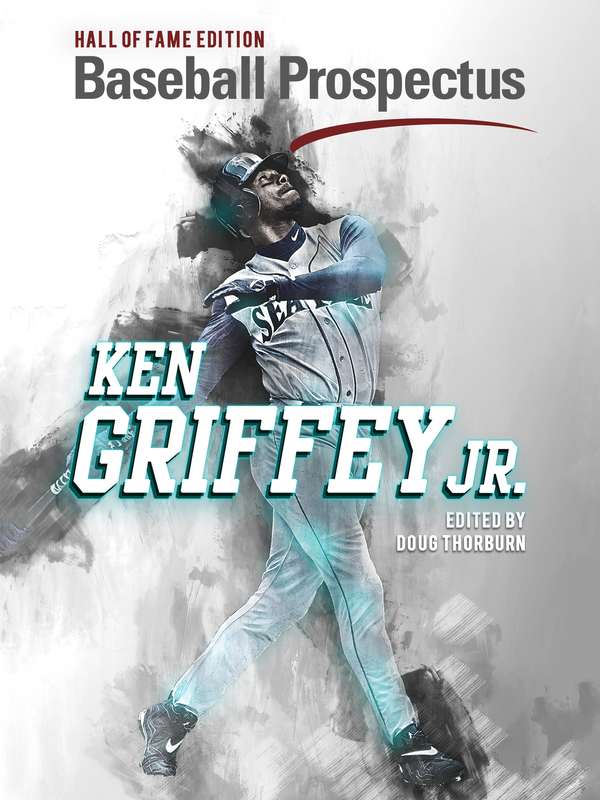 First, when the count was 0-1, he began the season seemingly eager to limit the pressure of falling too far behind by swinging on nine of the 17 pitches he saw. Once he was traded, however, an immediate shift happened: Bautista only swung on three of 20 pitches at this count between May 22 to June 2. The pressure instead falls back on the pitcher: it’s up to them to throw a strike. Similarly, in full counts in Atlanta, Bautista eschewed the chance for a walk almost entirely, swinging 12 times on 14 pitches. Though a smaller sample size, the New York half saw him swing only four times in nine instances. Is the quasi-spring training effect in force here? Of the 13 players aged 36 or older who participated in spring training this year, nine had fewer plate appearances there than Bautista did in Atlanta. 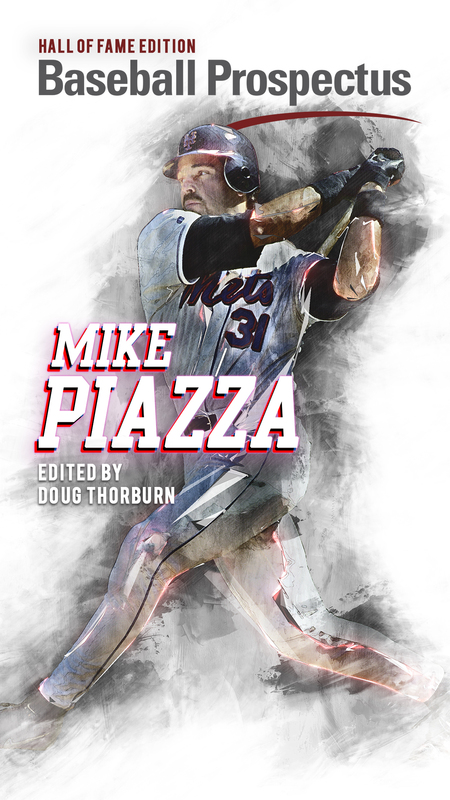 With the thousands of plate appearances of his to analyze, the approach in the latter half of his early season more closely mirrors his career discipline, contrasting the free-swinging, low-contact former (i.e., quasi-spring training) half. Even after seeing major-league pitching for a decade-plus, there’s no substitute for getting plate appearances in and re-adjusting to stay in one’s best form. 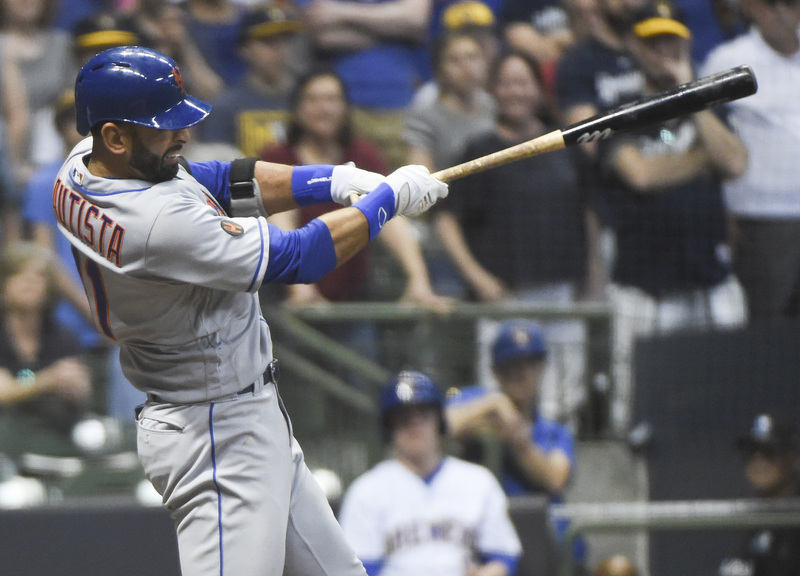 Renewed patience is a sustainable change that can benefit Bautista and the Mets the rest of the season. However, his peak-era trademarks have not materialized: he’s lauded for his numbers versus left-handed pitchers, but he’s yet to manage a hit against one on anything other than a four-seam fastball for either team. Similarly, his home runs per at-bat ratio is following the radical upswing of last year’s 25.5 that cleared his 2010-2016 ratio by nearly 12 at-bats. When the BABIP stabilizes, how these numbers react will be the true test of if his 2018 can be seen as a tale of two teams.